Probiotics are live microbial food supplements that provide several health benefits, as they help in maintaining excellent stability and composition of the intestinal microbiota and boost the resistance against infection by pathogens. Probiotics can be considered as potential functional foods, as they offer health benefits much more than the traditional nutritional foods. The requirement for probiotic functional foods is rapidly and progressively on the rise because of increased awareness of the public regarding the impact of food on health. Probiotics are now emerging as a promising key category of food supplement around the globe. There are now plenty of evidences backed up with high-quality, scientific clinical data to advocate that probiotic involvement could indeed be successful in the different types of diarrheal diseases, the modulation of immune function, the prevention of colon cancer, and other chronic gastrointestinal inflammatory disorders. The potential effectiveness of probiotics in treating or preventing neurological diseases is becoming a theme of great interest. 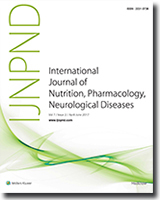 In recent years, substantial interest has been dedicated to discover the functions and therapeutic effects of probiotics in a wide range of neurological conditions. 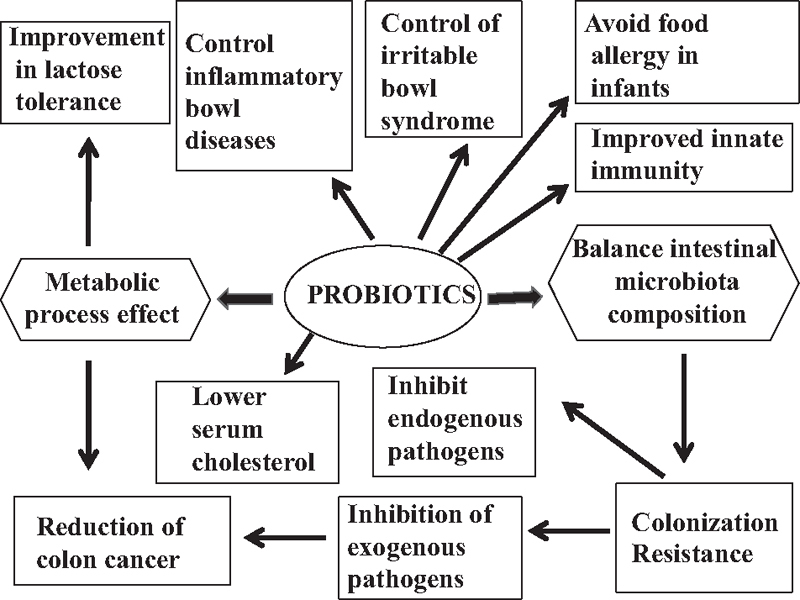 This review examines different major functions of probiotics such as probiotics as functional food, probiotics in the improvement of human health, and probiotics to treat and prevent neurobehavioral diseases. Background: At least 350 million people live with depression, and it is the leading cause of disability worldwide. Symptoms of depression are often overlooked and untreated among the elderly because they coincide with other problems encountered during this age. The aim of this study was to assess the rate of depressive symptoms and associated risk factors among the elderly. Materials and Methods: A community-based, cross-sectional study was conducted among 440 individuals belonging to the elderly population from November 2013 to October 2014. A five-item version of the Geriatric Depression Scale was used to rate the depressive symptoms among the elderly besides asking socio-demographic details. Data were collected, coded and entered into Microsoft Excel spreadsheet, and it was analyzed using the Statistical Package for the Social Sciences version 16 software (SPSS Inc., Chicago, IL, United States). Univariate analysis was performed using chi-square test and odds ratio. Binary logistic regression was used to know the relation of various risk factors with depression. Results: The rate of depressive symptoms was 17.5% ± 6.56. On univariate analysis, depression was observed more in females, the widowed, the illiterate, people with low socio-economic status (SES), those who were financially dependent and those having disturbed sleep. On applying binary logistic regression, only SES and sleep pattern were found to be significant variables influencing the presence of depression in the elderly. Conclusion: Depression is an emerging public health problem of today’s world, especially among the elderly who are less educated and with no source of income, as they are financially dependent on others; in addition, loss of spouse adds to their woes. Introduction: Fish population is generally considered very sensitive to all kinds of environmental changes to which it is exposed, as they are exclusively aquatic with an external mode of fertilization. The aim of this study is to highlight the effects of some of the most powerful environmental toxicants such as mercuric chloride (HgCl2) and polychlorinated biphenyls (PCBs), which alter the behavioral response, embryo survival rate, embryo hatching ratio, mortality rate, and heart rates of Danio rerio (zebrafish) embryo during its developmental stages. 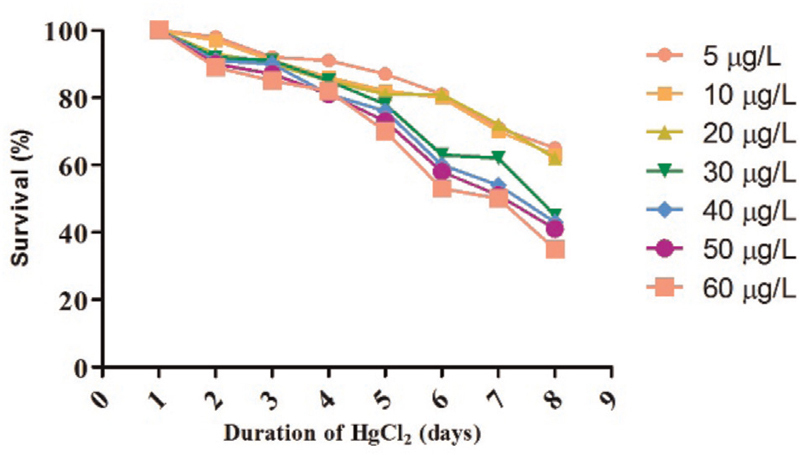 Materials and Methods: Zebrafish (D. rerio) were exposed to progressive concentrations of HgCl2 and PCBs. The water quality parameters were analyzed, and the acute toxicity test was conducted using eight fish for different concentrations; the results were compared with the control group. In addition, behavioral changes at each concentration were observed for the individual fish. Results and Discussion: The fish were exposed to various concentrations of 5, 10, 20, 30, 40, 50, and 60 μg/L of HgCl2 and PCB for a period of up to 2 weeks. The toxicity was concentration as well as time dependent. Toxicity tests revealed that the larvae of zebrafish were more sensitive to these toxicants as compared to the embryos.